Heat butter over a medium heat in a large frying pan. Add mushrooms and cook, stirring every few minutes or until mushrooms are browned and tender. About 10 minutes. Add lentils and tomato paste and cook until warm. Taste. Season and serve with parsley on top. short on time? – use a drained can of lentils instead of cooking your own. vegan / dairy-free – replace butter with coconut oil or olive oil. 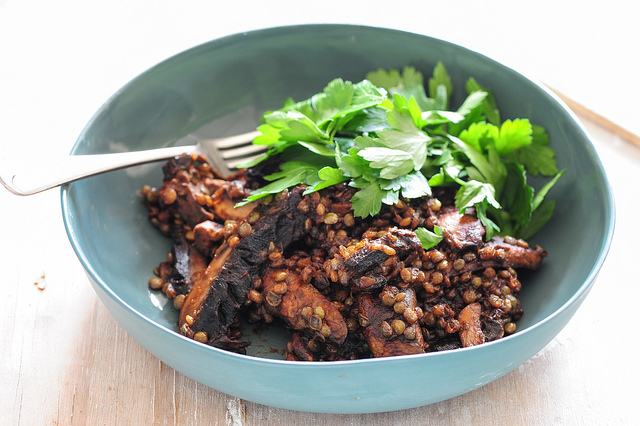 need help cooking your lentils? – just simmer like pasta until tender. Depending on the type of lentil it will take from 15-30 minutes. paleo / lentil-free – replace lentils with minced (ground) beef – make sure it’s well browned and cooked through before serving. different veg / mushroom-free – replace mushies with eggplant (aubergine), kale, broccoli brussels sprouts – whatever you feel like really.